The view of the Canyons will strongly remind you of the Scottish Highlands at their best. 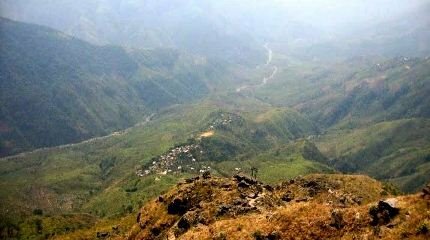 Also referred to as the “Sit Valley” by the locals... the Laitlum Canyons are an hour’s drive away from Shillong right there on the Mizoram highway. Laitlum Canyons literally translates to “end of hills” and it does justice to its name. The tourist flow to this spectacular place is relatively less and though this means inconvenience... there are no restrooms or proper eateries nearby, the beauty of the place has managed to remain unspoilt. On most days you will find apple cheeked kids running around selling hard boiled eggs while their mothers trail them with kettles of steaming hot black tea. If you wish for any more refreshments, arrange those yourself and bring a packed picnic basket. This is the perfect site for a long hike or a short 2 km mini hike... whatever you choose, it’s better done in a group. Most of the time, the canyons are shrouded in fog and that adds to their ethereal beauty. There is a trail that ends up in a steep flight of steps that forks up and then down to reach a small local village... you could take that if local Meghalaya life fascinates you. This village is Rasong which has 300 odd inhabitants who still rely on an old fashioned ropeway pulley that transports food and other commodities to them (incidentally one of the few places in the world which still relies on a pulley system of commodity transport). The stairway that leads to Rasong has close to 3000 steps and you will pass through bamboo plantations and wild orchid groves on the way. Incidentally this rather arduous path is the only way villagers can go to the nearest market. If the pulley is out of order, the villagers physically carry out their crops to the nearby market and bring in food and other commodities in traditional large baskets. Interestingly, broom plants are the main crop at Rasong... the dried structures of these plants are made into the hardy Khasi brooms which sell like hot cakes in the Shillong markets. Otherwise there are a multitude of trails and some paths will lead up to tiny slate roofed homes that are perched at dizzying heights of the canyon. The locals literally farm on the edges of the cliff and the profusion of colors and lush vegetation in dangerous looking spots will surprise you. Another option is to trek to the Smit Village (6 km away from canyons) which has a historical attraction... the ling Shad, a traditional house. The Ling Shaad is the power house of the Hima Khryim (the ruling tribe of Khasis) and the house is believed to be more than a century old. You can catch a bus back to Shillong from Smit Village. Don’t miss out the beautiful Laitlum stream that lies under an ancient looking wooden bridge. The perfect place to stand and stare at nature or click countless photographs... this is also a 270 degree viewpoint that will present you with the view of the 4 nearby waterfalls. Climb up to the flattish grass filled hilltop that overlooks the valley... and you will be able to see some stray shops. Tea sellers abound here and usually there are flocks of cute looking livestock around. The beauty of the canyons has been explored in the recent Bollywood film ‘Rock on 2’. Best visited before 5 pm. From Shillong you need to turn eastwards on MDR32 towards the Laitumukrah point and then turn right at Demsein long Bus Stop and then take a couple of left turns till you reach Sawlad Bus Stop and then reach NH 44. Turn right to reach Smit Road and then drive on straight to Jongsha mawkynrew road... continue straight till you reach Unmed Road which is the last motorable point before the canyons. The distance between the canyons and Shillong is 23 kms. If you take a taxi, the fare should be between 1000 INR to 1200 INR. If you are returning from Cherrapunjee to Shillong then don’t take NH 206 and instead opt for the road that passes Smit Village (this is a longer picturesque road). En route you will come across the Laitlum canyons.